It is a joy to give to the Lord! Here a few different methods you can use to give, but regardless of the one you choose, please give joyfully and praise God for the opportunity to worship Him with your tithes and offerings! 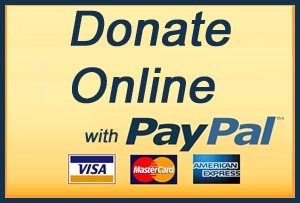 You can make a one-time donation or set up a recurring donation using PayPal. 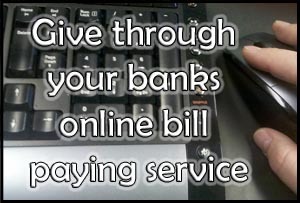 Many people intend to give weekly but because they pay most of their bills online they forget to bring a check to church with them. Using our Online Giving is a convenient way to give from your home. 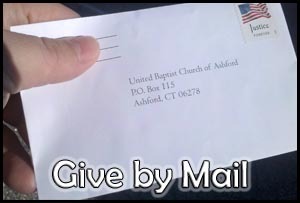 You can set it up to give on a weekly or monthly basis to help you faithfully give. With your PayPal account you can change the amount you give or cancel it at any time. Although we do not pass an offering plate on Sunday mornings, giving is a part of the worship service. 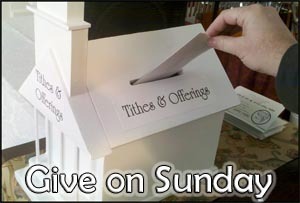 We have an offering box available for you to give your tithes and offerings unto the Lord! It is a joy to give so I encourage you as you place your tithes and offerings in the box to offer a quick prayer of praise and appreciation to our awesome God!